T5 is a 28-foot foiling monohull, and has been significantly modified to match the fundamental parameters of the AC75, the class of boat that will contest the 36th America’s Cup. 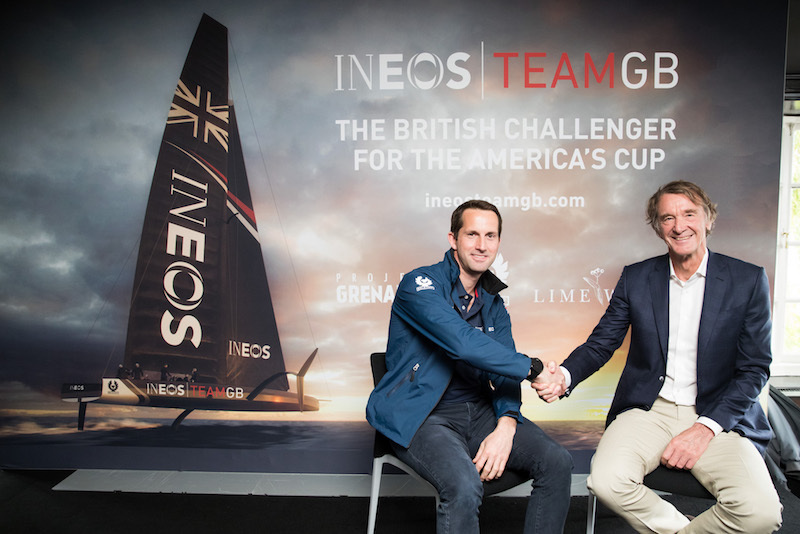 When I interviewed INEOS Team UK skipper and team principal Sir Ben Ainslie for the latest episode of The Yacht Racing Podcast it was late on a Friday afternoon after what I could only imagine was the end of another long week of preparations for the British America’s Cup syndicate. Ainslie was speaking to me from his team’s plush headquarters in Portsmouth, England, where he told me, the weather was being characteristically wintery and unpleasant. “It’s blowing about 40 knots and five degrees here in Portsmouth,” Ainslie said with a wry laugh. These are not by any stretch of the imagination pleasant sailing conditions and certainly not conducive for testing sessions aboard the squad’s scaled down foiling monohull test boat. During his Olympic campaigning days in the Laser and the Finn Ainslie was no stranger to grinding out his training in the depths of the UK winter out on the water in south coast locations like Weymouth and on the Solent. In the run up to the last Cup his Land Rover BAR challenge were regularly on the water over the winter but this time around he revealed they have taken a different approach by decamping to a top-secret warmer weather location. “It’s a great venue [here] from March through to November – we have generally pretty good conditions. Reasonably flat water, though the tide can be a little bit of an issue in terms of performance monitoring. 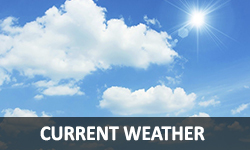 “We are obviously limited with the weather in the UK over the winter months,” Ainslie admitted. “In the last campaign, we grunted up and fought through a couple of winters. I think a few sessions we were out sailing our foiling multihull around in the snow. Already knowing the answer I would get I nevertheless asked the question as to where the alternative training venue might be. Other than the fact that the team had moved “overseas” the Ineos skipper remained otherwise tight-lipped about the matter. Ainslie’s team were by a large margin the first of the America’s Cup contenders to get a foiling monohull on the water. Their 28-foot modified Quant design has room for two crew and has enabled the team to get a jump start on the constant development process all the teams are engaged in as they try to master this radical new America’s Cup class. Despite his vast experience Ainslie described the experience of sailing the Quant as “an eye-opener”. “As you can probably see by some of the footage, we’ve had some pretty big wipe outs, some fun moments, and some pretty exhilarating moments as well,” he said. 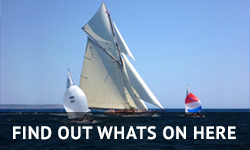 “Really, just learning how that concept of boat sails and operates from a sailing perspective. Primarily, the focus, as you can imagine, being on the design and the development. Ainslie admitted it had been somewhat of a leap of faith for the team when they launched the Quant for the first time to find out whether Emirates Team New Zealand’s at that stage unproven concept of a foiling monohull would actually work. “Well, Grant Dalton told me that this boat was going to work. 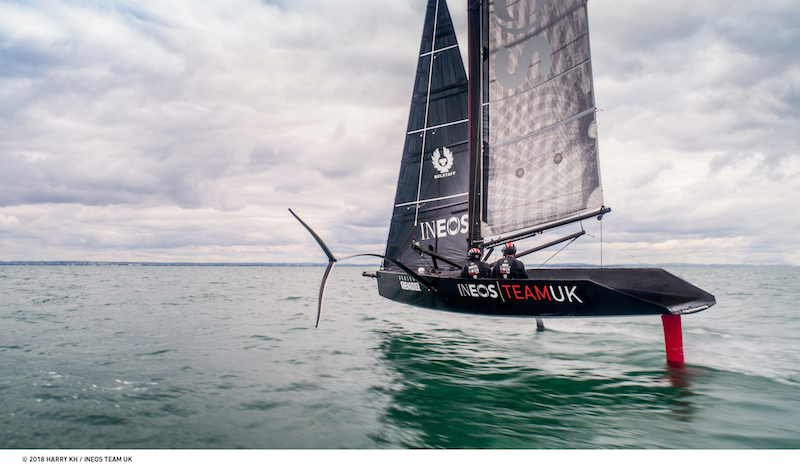 [He said] it was going to be a fantastic boat, so we just believed that would be the case,” Ainslie told me with an ironic tone to his voice. “In all seriousness, we didn’t know. It only looked like a very, very exciting concept. We did have a meeting with Grant and Dan Bernasconi and a few of the other guys from the other teams and talked through it. A few eyebrows were raised, and I think probably if you ask Grant and Dan honestly, they weren’t entirely sure if the concept would work either. “But they’ve done a great job. I think it’s a really neat compromise. Clearly there was a push for monohulls and something a little bit like what we’ve traditionally seen in the Cup, but also keeping these fast foiling boats alive and that development going as well. “I’ve got some feel for it in my mind – just the performance predictions, and so on. It’s going to be an exceptional boat. To look at it’s going to be an extremely impressive boat. To sail it, it’s going to be a huge challenge. 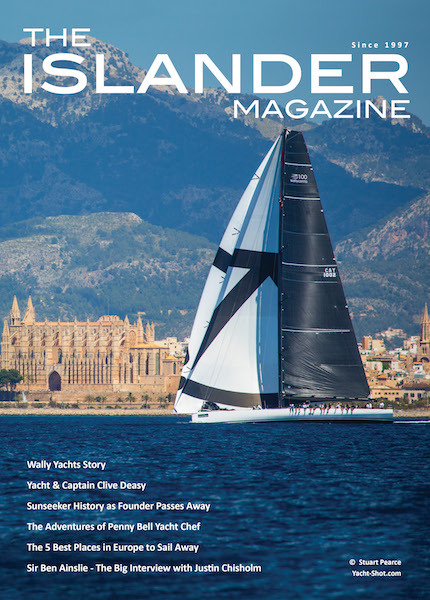 “You look at the roles on the boat – the energy consumption, having the Code Zero, the sail handling, the manoeuvres – it’s going to be really hands-on for the sailing team to be able to sail the boat to its maximum performance and to handle it that way. 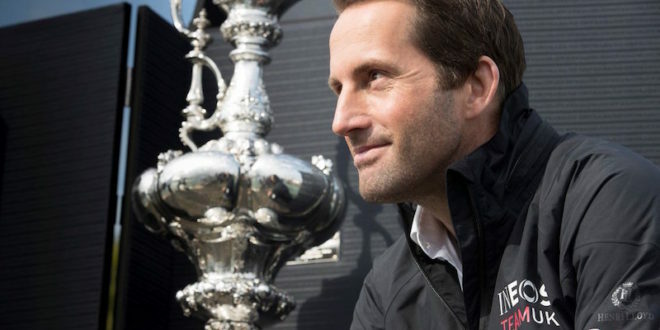 Ainslie’s decision to sever ties with his existing sponsor base in favour of a single deal with Britain’s richest businessman Sir Jim Ratcliffe – the fiercely patriotic owner of the Britishmultinational chemicals company Ineos – made waves in the sailing industry when it was announced. Was it really true that the 110-million-pound deal had been done over a pint in a London pub, I asked? “There’s a little bit of conjecture whether it was a pint or gin and tonic,” Ainslie replied. “I think there was a quote where he said it was the most expensive gin and tonic [ever], in his experience. According to Ainslie Ratcliffe he and Ineos Team UK CEO Grant Simmer meet with Ratcliffe once or twice a month to update him on the campaign’s progress. “He’s very, very interested and engaged in what we’re up to – both from the sporting side and the technical side,” he said. “I’m sure as we get closer to getting into competition and closer to the Cup itself, will become more and more engaged. Obviously, the INEOS business is growing and is incredibly successful and that is Jim’s main focus. Did only having to deal with one backer simplify things for Ainslie, I asked, and free him up to focus more on the sailing side of the challenge? “Yes, it does definitely,” Ainslie replied. “Last time around we were obviously a new organisation and we had some extremely generous investors and sponsors. But it was very difficult in that by the time we got that funding in place we were behind the existing teams from 2013. “Really [we were] playing catch up from day one and obviously weren’t able to bridge that gap – although I thought the team did an incredible job, particularly in the last four or five months of the campaign to really make some big gains in performance. “Then, we had this understandably difficult process coming back, identifying where in the organisation we didn’t perform well enough [and asking] what changes do we need to make? “Going through the proposals from Grant Dalton and Max [Sirena] and the guys at Luna Rossa about the next cycle there was a realisation that: this is a really impressive boat – but it isn’t going to be cheap. Looking at the commercial world, especially in the UK with Brexit and the financial markets and so on we realised it was going to be a real, real struggle to raise the required budget. “Now, we’re very fortunate to have the backing, the budget committed, and to be able to make some really nice changes. To be able to attract people like Grant Simmer and Nick Holroyd and some other key signings to help bolster us in a few key areas has made a great difference. When I asked for his view on the arbitration case reputedly going on at the moment regarding the status of three late entry teams, Ainslie was understandably reluctant to make any comment given the sensitivity of the situation. However he did tell me that the British team put its full confidence in the arbitration process and the ability of the three-man panel to sort things out equitably. “Ultimately the arbitration panel have got to decide this, and we just want this to be decided as quickly as possible,” he said. “We just want to get on with this and any indecision or uncertainty about what teams are entering or not only has a knock-on effect to delay the process of getting foil-arms [part of the one-design supplied elements of the AC75s supplied to all the teams] delivered and event schedules out and building towards a good competition. “We put our faith in the arbitration panel, and we are sure they will come to a sound judgement and then we will all crack on with it. That’s how it really works and we look forward to them resolving this issue as soon as possible. You can listen to Justin’s full interview with Sir Ben on Episode 8 of the Yacht Racing Podcast. It’s available on iTunes/Apple Podcasts, Google Podcasts, Spotify and most other major podcast hubs.